Which will it be: coffee or tea? Whatever your favorite, each carries a long, delicious history and a wealth of flavor, health benefits and comfort. 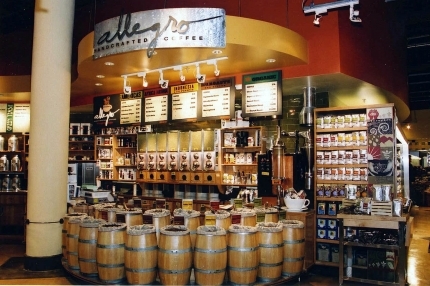 To bring you the best, Whole Foods Market acquired Allegro Coffee Company back in 1996. Allegro’s commitment to transparent sustainable sourcing and ethical trade was a natural fit to our Core Values. While we also feature other local coffees in our stores, we are proud to offer a wide selection of bulk and packaged beans from our own Allegro Coffee Roasters. The Allegro sourcing team spends most of their time on the road (or in a plane) traveling the globe searching out coffees that are as unique as the places they come from. Currently Allegro is sourcing coffee from 25 different countries and many more family run farms and coffee cooperatives within each country. The coffee growers we partner with share our commitment to caring for the planet by growing coffee in environmentally friendly ways and many are Organic, Rainforest Alliance, Fair Trade Certified and Whole Trade Guaranteed. Once harvested, our coffee beans make the journey from origin to our roastery in Colorado where each lot of coffee and every blend is roasted to bring out inherent regional characteristics and flavors. The result is a full range of Sustainably Delicious™ coffees that span the roasting spectrum from light to extra dark. Over the years Allegro has expanded their product line to include fine tea, wellness tea, and drinking chocolate— sourced with the same emphasis on organic and sustainably grown ingredients. Through all this growth and change, the initial goal has remained the same: from coffee beans to tea leaves, herbs, botanicals, and chocolate—Allegro passionately and continually sources the best ingredients the world has to offer. If you’re a tea connoisseur, you’ll appreciate our tea selection. In addition to Allegro teas, we source teas of every type from all the major tea-growing regions of the world. So whatever it may be, coffee or tea, you are assured of both quality and conscience when it comes from us.